Chichester Fencing Club meets every Friday night in the sports hall at Chichester High School for Girls located on the Kingsham Road Campus. Adult session: 7:30 - 9:30 p.m. Note: This is a 10 week term. 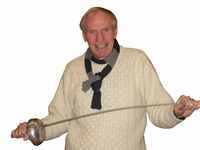 Chichester Fencing Club also visits local schools to promote fencing for young people. Some of the schools we visit are: Oakwood School, Westbourne House, Ditcham Park Scool, Bishop Luffa, Seaford College, Windlesham House, Walberton, Prebendal School and Central School. Please note that sessions at schools are only open to pupils and teachers. 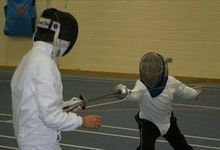 Chichester Fencing Club also visits the Arun Leisure Centre and the 5-11 Club as well as schools. If you are interested in attending any of these sessions or would like any further information then please contact the club officials.